Scotland star Stuart Hogg will make his first appearance in seven weeks for Glasgow in Saturday's Champions Cup quarter-final at Saracens. Hogg injured his shoulder in the Six Nations match with Ireland in February and hasn't played since. England captain Owen Farrell starts at fly-half for Saracens, while Maro Itoje returns at blindside flanker and George Kruis is back in the second row. 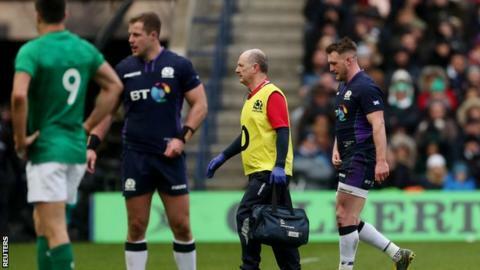 Itoje injured his knee during England's opening Six Nations win in Ireland. Saracens and Glasgow have a rich, albeit rather one-sided, history in this competition. The Scottish side have not beaten their English counterparts in five attempts, although the Warriors have won their last five Pro14 matches to keep them top of Conference A. The teams have already met twice in the pool stages this season, with Saracens winning both matches on an unbeaten march through their qualifying group. This season's dominance followed a comfortable Sarries victory in Glasgow's only quarter-final appearance at the same venue in 2017. Victory for the visitors will result in a first semi-final in the club's history, and they will be boosted by a return to fitness for talisman Hogg. However, co-captain Ryan Wilson, Tommy Seymour, DTH van der Merwe, Huw Jones, Nick Grigg and George Turner are among those who remain sidelined with injury. "It's a massive weekend and exactly the kind of game we want to be competing in," said Glasgow head coach Dave Rennie. "We know Saracens well, having played them twice already this season. We tested them for big chunks of those games and know that if we play at our best for 80 minutes we have the firepower to make it to the semi-finals." Meanwhile, two-time winners Saracens are bidding to reach a top-flight European semi-final for the seventh time. Captain and former England centre Brad Barritt believes the Scottish and English rivalry will provide some "added spice" to the tie. "It's always going to carry a little bit of a flavour and taste to the encounter," he said. "To have a home quarter-final is testament to the work done in previous rounds but by no means gets us the victory. Preparing to play a team for a third time requires a different outtake."